[Video] Klappe is concerned with editing the [video] environment and how this might inform the [real] environment. [Video] Klappe is based in a video process, and presents the results of a number of editing techniques, such as transcription, translation, the selection of still images, and editing using drawing and text. The publication includes 87 drawings and a transcription of speech that was generated during the recording of the video material. The backdrop of [Video] Klappe is the town of Niederbrechen in Germany and the publication could indeed be understood as a love letter to the town. [Video] Klappe beschäftigt sich mit der Bearbeitung des [Video] Umfeldes und den möglichen Auswirkungen hiervon auf das [reale] Umfeld. Die Grundlage für [Video] Klappe ist ein Videoprozess; es stellt die Ergebnisse einer Reihe von Bearbeitungstechniken wie z.B. Transkription, Übersetzung, Auswahl von Standbildern, sowie Bearbeitung mittels Zeichnungen und Texten vor. Die Veröffentlichung enthält 87 Zeichnungen sowie eine Sprachtranskription, die während der Aufnahme des Videostoffes erstellt wurde. Der Hintergrund von [Video] Klappe ist der Ort Niederbrechen in Deutschland, und die Veröffentlichung kann durchaus als ein Liebesbrief an Niederbrechen verstanden werden. Available at: Amazon.co.uk; Amazon.com; Amazon.de; Barnes & Noble; Waterstones; Foyles; and many other places. a relational [video] grammar: extrapolation is an editing experiment that uses drawing and the addition/reconfiguration/obliteration of text to examine speech generated during the making of direct address to camera, within a context of artists’ film and video. a relational [video] grammar: extrapolation tests the conceptual relationships between linguistic and technological editing processes. The multiple layers of information within the pages of this publication contain narrative possibilities that engage with these editing processes on many levels, without the necessity of using the format of video beyond the recording of the speech. 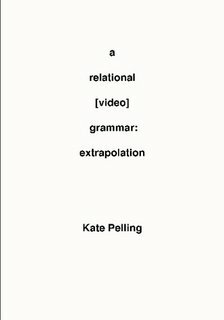 a relational [video] grammar:extrapolation is the first publication to focus entirely on the drawing and text elements of Kate Pelling's practice.